In case any wonderfully original Hollywood producers are considering a Back To The Future reboot or sequel, we've tapped our knowledgeable and geeky readers for this list of ten awesome alternatives to the DeLorean-based time machine. Great Scott! Great Scott: If Marty decides to use the time machine to go back in time and invest in Apple and Ford at the bottom, he can afford the $650K W12-powered robber-baron ride. Great Scott: The New Stratos is a modern take on the insane Rally car. With its familiar wedge design and mid-mounted Ferrari V8 it'll hit 88, and 98, and 108, and... well you get the picture. Great Scott: There are two things that make the DeLorean distinctive: the gullwing doors and the stainless steel paint job. The SLS AMG's got the hard part covered, now all you have to do is add a stainless steel sheen. Perfect for hoverboard entry. Great Scott: Where we're going... we don't need roads. Great Scott: "You can all go home to 1955. The batteries help with FLUX field dispersion and negates the need for a lightning strike...so instead of hitting 88mph and time travel, you'd have to hit 88mph and slam on the brakes to get the heavy electrical regeneration needed for time travel...which also REALLY helps with the landings IMO. And hell, this think looks alien to farmers NOW, let alone in 1955 when Porsches were bathubs." Great Scott: " In the original, Spielberg didn't chose the obvious (Countach, the Testarossa, the Stratos) and even Bertone would have created something weirder than the DeLorean. The Marussia is a known car, yet not a very popular one, and is strange and has a really cool interior." Great Scott: "Nissan GT-R. Same pseudo-futuristic look. About the same price (inflation-adjusted) as the Delorean in '85. Futuristic time-circuits would look at-home with all the other gadgets on the GT-R's dash. Both have 6 cylinder engines. New plot twists could involve the grenadeing the transmission sometime in the past, or running out of plutonium and having to run the flux capacitor off of the turbo for the right bank of cylinders (using both would make too much power)." Great Scott: "Abnormal doors, seating for two, and still looks modern. I'd allow it provided SAAB doesn't go the way of DeLorean..."
Great Scott: It'll always look retro and it'll always look futuristic, which is an advantage when you're traveling around the world and around time. With a hydrogen fuel-cell under the long hood, you can make your own fuel. Also, it is badass. 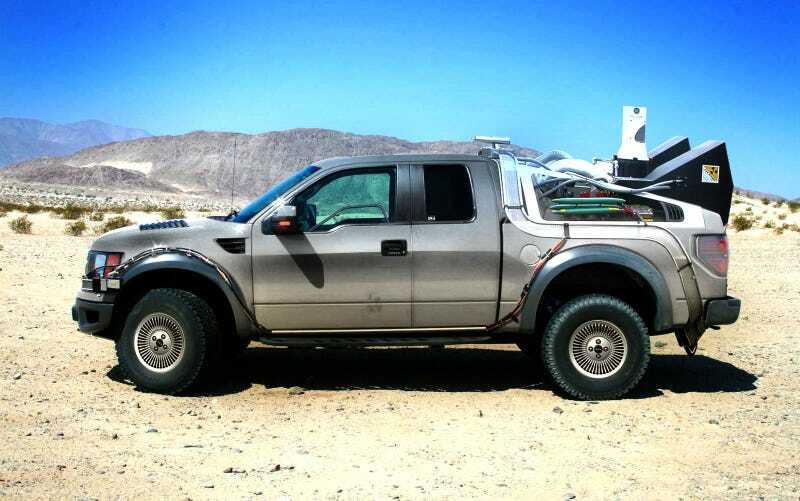 Great Scott: "The idea should be that no matter when you go in time, you need to be able to drive your vehicle to 88 miles an hour and the only production vehicle that can do that over any terrain is the Raptor. I understand a sports car is "cooler" but if they go back to the old west or somewhere else that doesn't have roads, the vehicle needs to be able to handle te rough stuff at speed. At least before the hover conversion."